SeaWorld filed a lawsuit Tuesday against the California Coastal Commission, which two months ago issued a ruling that would end the breeding of captive killer whales at its San Diego theme park. The commission's October order was a condition to its approval of a permit to allow SeaWorld San Diego to expand its orca tanks. 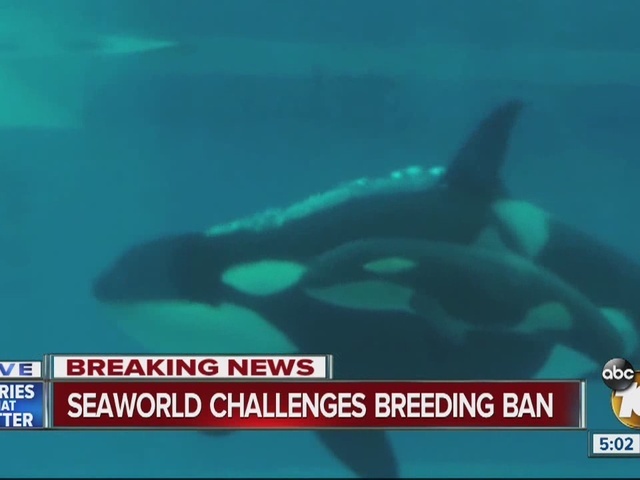 Not being able to breed its orcas would eventually result in the end of the park's "Shamu" killer whale shows, handing a major victory to animal rights advocates. About a week after the ruling, SeaWorld announced it would sue to get the order overturned. Theme park officials contend the commission doesn't have jurisdiction over animal welfare. filed in San Diego Superior Court. access thereto," the suit says. approved the orca enclosure expansion. RELATED: New attraction coming to SeaWorld? "The (commission's) jurisdiction over marine mammals is expansive," Goodman said. "Although the Coastal Act focuses on protecting open spaces and wildlife in their native state, it contains no limiting language that excludes captive wildlife." SeaWorld officials had agreed earlier with commission staff not to increase the park's orca population except through occasional captive births or rescues authorized by government agencies. Park officials said they have not captured orcas in the wild for decades. SeaWorld also pledged that the facility would not house any orcas taken from the wild after Feb. 12, 2014, nor utilize killer whale genetic material taken from the wild after the same date. After the commission's ruling, park officials also said their "Shamu" shows would be changed to be more educational in nature. Executives at the theme park on Mission Bay want to build two orca pools, one filled with 5.2 million gallons of water and the other with a capacity of 450,000 gallons, to replace the current 1.7-million-gallon tank. The project also would include replacing bathroom facilities for visitors. SeaWorld said it is regulated by the U.S. government, with frequent random inspections by federal veterinarians and other officials. The park also has to pass strict licensing requirements every year and is accredited by organizations like the Association of Zoos and Aquariums, according to SeaWorld.